Milan Jurinca was awarded a one year, $1.4 million contract in his salary arbitration hearing. It was a hearing that was reported as very professional between both parties. The Capitals can not walk away from Jurcina's contract and he should become a restricted free agent at the end of the season. Shaone Morrisonn was awarded a one year, $1.975 million contract last summer for his arbritation hearing. He signed his qualifying offer this summer to remain with the Capitals. Update: Okay, maybe the score isn't that big, official word is Jurcina was awarded a one year, $1.375 million contract in arbitration. A young man was cross-checked in the chest four times with a hockey stick, then a final blow to the chin knocking him out. If it had played in a back ally in any town USA, it might be cause for a long term prison sentence. But if it happens on the rink, maybe a game suspension. An article in The Globe and Mail brought up the question of where is the line and can you cross it. Where does a bad decision on the part of a hockey player become criminal. Dive into stories about Todd Bertuzzi and Marty McSorley. While many of those incidents could just be hockey plays that just went bad, are you still responsible for your actions whether you have a jersey on or not? Let's take the NHL and the minor leagues out of the equation. What if this happened at a men's beer league at Kettler? Things like this sometimes happen, a hockey play gets out of hand and a stick is being broken over someone's head. Most times that player is banned from the league, sometimes banned from ever coming back to the rink. Sadly, I have been involved in some of those types of games. Where a guy got hit into the boards from behind after the whistle, or a player took exception to a non penalty call and slashed the referee. When does it stop being hockey and start becoming assault. Obviously there are rules to how far one can go before being tossed from a league or from the rink. But when does the law step in? For this case in the Quebec Major Junior Hockey League, the judge is deliberating on what should become of the hockey player that went after another player. One side debating that the victim should have stood up for himself, grabbed the stick of the perpetrator or skated away. The court will decide if the action was "assault causing bodily harm." It should be interesting to see what the courts ruling will be. Milan Jurcina will go forth with his arbitration today. I am sure we will hear word on what the outcome will be later today. Jurcina brings size and some physicality to the blue line. He also has some great defensive sense. Offensively speaking, Jurcina does not bring a lot to the table. He has only scored 46 points in 275 games played for his career as a pro in the NHL. He managed 3 goals and 11 assists for a career high of 14 points last season. While Jurcina is not really a hinderence to the defensive squad, but he is no asset to the offensive side either. His hits are just about his only good side of being a Capital thus far. He had a few good stick checks and defensive plays in the regular season and the playoffs, but his game didn't step up with the absence of his teammates like John Erskine and Jeff Schultz. Is Jurcina worth keeping? Sure, he has the speed and youth needed to keep growing in the league. The Caps also seem to be on the right track bringing in replacements for the departing Viktor Kozlov and Sergei Fedorov. Mike Knuble and Bredan Morrison (both Michigan alum and wolverine teammates) will step in to fill the gaps. Both free agent signings make a lot of sense. Knuble brings a grit to the top line as well as an impressive Stanley Cup resume to go along. Morrison, when healthy, can bring a good two way prensence on the second line. If he plays inspired, he could be a major help in that center position. George McPhee may skip looking for a tough guy in the wake of Donald Brashear's departure to the New York Rangers. Instead he can play with his cap space more (bring up more talent from Hershey, move players around and the like) and hope that Matt Bradley and others can step in if things get too rough. Finally, Fedorov claims he was swindled out of $43 million over the past 11 years from a finacial advisor. He falls into a long line of hockey players that seem to be conned out of their money by slime looking to make a quick buck. What was wrong with hiding the money in a sugar jar and burying it in the back yard? Brent Johnson signs with the Pittsburgh Penguins after becoming an unrestricted free agent this summer. For the Capitals, it is tough to see a good goaltender go. But the log jam of goaltenders in the system makes decisions easier for the Caps. It also gives Semyon Varlamov a chance to prove himself for an entire season. Johnny experienced one of his best seasons last year with the Caps. Known mostly as a back up for Olaf Kolzig, he nearly took the number one job from summer signee Jose Theodore before injuries hindered his game. His season ended with the Capitals after he went for hip surgery in early February. He maybe best remembered last season for his unbelievable save on a breaking Blake Wheeler on December 10th against the Boston Bruins. If Johnson can stay healthy, he should be a good back up for Marc Andre Fluery in Pitt. Asking a player not to take part in on-ice activities for their country's team is kind of like asking them to to kiss their sisters. It just not going to happen. Earlier this week, the NHLPA asked players not to take part in on-ice practices due to the possibility of injury. The Players Union is worried about injuries and the insurance to cover said injuries. Since there is no deal between the NHL and IIHF, the country's hockey program is responsible for the players' insurance for any activity for international play. The NHL is not responsible for insuring the players. The Union obviously is looking out for their own (as they often do) and sent out a memo asking players to not take part of on-ice practices because of "unwarranted and unnecessary risk." (Joe) Thornton, who played for Canada at the 2006 Olympics. "We shouldn't have to worry about the business of things, but it's a fact, and the PA is there to protect everyone's interests," said New Jersey Devils goaltender Martin Brodeur, a three-time Olympian who admits he's confused as to why the NHLPA is more worried for this Olympics than they were in 2006. "It's just normal that they have concerns." It means the Players Union, the NHL and the IIHF need to sit down and hammer out a deal in the coming years. If the Union and the league decide against using NHL players in international events like the Olympics, that will greatly impact players that want to play for their countries and they may go elsewhere rather than the NHL to play for their homeland. Asking Alex Ovechkin not to play in his home country in another four years might be a tough pill to swallow for the player, the league and the Washington Capitals. This just points out the distance that the league and IIHF have to close in making a deal. The Phoenix Coyotes are making a go at staying in the desert. This time there is a bid that involves both U.S. and Canadian interests that would like to keep the Coyotes where they are. Not only does it make sense (since the Coyotes signed a long term contract with the venue), but hockey in that part of the world is starting to gain some interest. If the 'Yotes can put some wins together, the stadium will fill. Speaking of owners and money, Len Barrie (the part genius behind the Lightning last season) finally showed proof that he can sustain the team as a majority holder. Barrie basically took over the team with Oren Koules and tried to rebuild the team through free agency. After firing the coach, John Tortorella, and the GM, Jay Feaster, the Lightning floundered near the bottom of the Eastern Conference standings. There are still some rumbles that it's not new GM Brian Lawton calling the shots, but the two owners. That forced Bettman's hand to make sure Barrie had at least $10 million to maintain the team. Believe it or not, but there are still a fair amount of good players that are free agents and haven't signed with a team. For the Caps, Brent Johnson, minor leaguers Alex Giroux, Graham Mink, and Bryan Helmer are still on the list as free agents. Milan Jurcina's arbitration hearing is set for July 28th. Garrett Mitchell (image left) was the youngest player at the Capitals' Development Camp this past week. At only 17 years of age, he was drafted 175th overall (sixth round) in this year's NHL Entry Draft by GM George McPhee. What the Caps saw in him was a energy player. A tough sparkplug with good wheels and a knack for mixing it up. He even got into a scrap last season with this summer's teammate Joel Broda. At 5'11 and 180lbs., it's clear the kid from Regina, Saskatchewan has some growing up to do. But the potential is there. "He's a character kid, a good leader who works hard, plays physical and goes to the net," Ross Mahoney, the Capitals' director of amateur scouting, said. "He's a lot like Stefan Della Rovere in those ways." Mitchell wasn't one of the stand out players of camp, but he wasn't bad either (one could say he was a stand out due to his age and inexperience). He figured in on some assists and just like every other new player to camp he may have been overwhelmed by the whole experience. I caught up with him right after the third scrimmage on Saturday and asked a few questions about his experience at development camp. Puckhead's Thoughts: What were your impressions of your first camp? Garrett Mitchell: The first couple of days everyone just got their feet wet. We didn’t play a game until the third day. I think for us, you know, those first couple of days are tough, but I think for everyone, we bounced back. I thought the pace was really good, even in this last game. It’s a long week and a long grind but I thought everyone just gave their all today. PHT: How well did you pick up the Caps’ system of play? GM: Every team you go to there is a little bit of a difference in the system or how the coaches want you to play. But, for the most part, most places you go it’s … a change here and there. But I thought I was quick to pick up on (the way they wanted me to play). I just can’t wait until main camp now. PHT: What do the coaches want you to improve on? GM: I am only 17. I think strength is an issue. Strength, speed, everything. You know you can always get better. There are not too many hockey players that can say they are at their best or they can’t get better. For that, you always want to get stronger, always want to get better in the corners or finishing pucks. You got to work to get better. PHT: What did you think of DC as a city? GM: We went on our tour. I know for us Canadian guys, we were going “What’s this building? What’s that building?” and the guys from the states are going, “Are you kidding me right now? !” For us it was unbelievable, to see the White House and the Capitol building and all that stuff. It was pretty cool for us. PHT: I saw on the video you almost missed the bus there at the White House, did you get away from the group? GM: (Chuckles) Well, there’s four of us kids and we are all from Saskatchewan so I don’t know what’s up with that. Us kids have never seen that before. It was fun for us to go see the White House and you see it on TV all the time. We got a little carried away and looked at it a little too long I guess. PHT: What’s the one thing you will take home from camp? GM: You look at the guys that have played here. You go in the dressing room and the weight room, every guy that has ever played since 1974 (for the Capitals) has their number there. You look around at the names and it’s pretty unbelievable whose played here. You got to take back that this is the next step, it’s that close, you just have to keep working for it. Show the guys back home if they try they can make it there too. Mitchell scored only 10 goals, 15 points for his hometown team Regina Pats. A team he will probably return to in the fall. He also racked up 140 PIMs, that included 14 fighting majors (here is a video of him in action). Definitely a tough kid. Mitchell will turn 18 in September. The Washington Capitals' Development Camp ended today with the third and final scrimmage. And team white swept all three games although they didn't dominate like they had in previous scrimmages. For the prospects it was a last ditch effort to impress management and coaches. Michael Dubuc scored another two goals for seven goals total in three games. He had a tremendous camp. His contract is actually through Hershey, but that could change in a heartbeat. He scored 35 goals in 49 goals with South Carolina last season. Others that impressed were Trevor Bruess, John Carlson, Dmitri Orlov and goaltender Braden Holtby. Carlson felt he didn't have the best camp, but he has improved since last summer. He looked a bit human today with two bad turnovers. His overall performance was very good through camp. He looks like he can make a smooth transition into training camp by the end of August. A player that made the switch from the white team to the blue one, Trevor Bruess also had an impressive camp. He is a hard working player, and it was apparent through out the scrimmages. Bruess had a couple of assists and worked well with the white team on a line with Andrew Glass and invitee Backman. Another good defenseman was Dmitri Orlov who had some dynamite hits and handled himself well with the puck. He was usually partnered with Carlson and the duo played very well together. Orlov was considered a steal in the second round of the draft this year. He has the potential to go further and it would be interesting to see him with bigger faster players. Braden Holtby had a good camp too. He had a great opening in the scrimmages when he posted a shut out in the 30 minutes he played. He came up with some good saves for his team and looked pretty good in net. He has filled out his pads from last summer, and looked much more confident in net. A surprise to this years camp might be Garrett Zemlak, who played well in the final two scrimmages. He nearly posted a shut out in today's scrimmage, and he kept his blue team in it in the second scrimmage by stopping everything that came his way. Impressive considering the white team dominated the second game and eventually won the game on seven straight third period goals. Those that might have come up on the disappointing side were some old hats. Like Francois Bouchard who didn't play bad, but didn't stand out either. Today he was a bit in and out of the play and only seemed to push his intensity button late in the third when he had a scoring chance that rang off the post. Jake Hauswirth also had a so-so camp. After lighting the lamp five times in last summer's camp, he hardly made much noise this year. In the third scrimmage he was lined up with invitee Meyer and Joe Finley. The line was a big one and had their moments, but they couldn't get the puck in the net. Finley played up as a forward in this game, and he did okay. There were moments where he was a little lost and his passes didn't connect, but he didn't do that badly. He admitted to reporters after the game that he was a bit uncomfortable at the position at first but if they wanted him to strap up as a goaltender he would do it. All in all this was a good camp for the prospects. Injuries sidelined Stefan Della Rovere and Anton Gustafsson. It would have been nice to see them continue on but why chance hurting them any more. Della Rovere had a sprained shoulder that kept him from playing. Gustafsson sustained a concussion when he crashed into the post and cut his head. Both players were a bit disappointed in the way their camp ended, but both promised to come back healthy and ready in August. Next up for the Capitals, training camp in August. Plus there might be a signing here or there to watch out for as GM George McPhee tinkers with his team. I did a quick interview with Caps' prospect Garrett Mitchell as well and I will post that a little later tonight. The Caps traded Keith Seabrook, a prospect drafted in the '06 draft, was traded to the Calgary Flames for future considerations. Who knows what those considerations are, maybe it's more hot dogs in the visiting GM's box. Actually this might be a player thing as Seabrook is from the Calgary area and plays for the Hitmen. 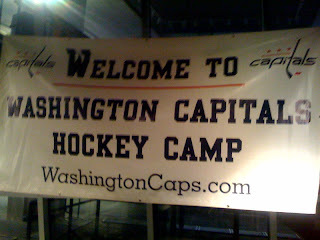 For more info on Development Camp, the Capitals have a page with videos and more at WashingtonCaps.com. Sorry for the late post, I had engagements this evening. Group A didn't just win the game by dominating almost the entire game, but also by scoring seven straight goals in the third period. Dustin Carlson's nightmare as the blue team's goaltender. It capped a great scrimmage for the boys in the white Capitals' practice jerseys in the second of three scrimmages schedule for the week as they win it 8 - 3. Group A had three dominating lines, the Backman/Glass/Bruess line (or the BBG line), the Perreault/Mitchell/Sheen line, and the Dubuc/DiSimone/Broda line. Each one of the lines scored at least two goals. Michael Dubuc now has 5 goals in this summer's camp, while Mathieu Perreault scored a pair today. The BBG line was a great grinding line that kept the blue side frustrated and making bad mistakes. The overall play was a bit sloppy, a sign that the week is wearing long with some of the prospects. Bad passes, misplays with the puck were the norm. If it were not for Garrett Zemlak putting forth a tremendous effort for the Blue team in the first half of the game, the white score could have easily reached 10 or 12 goals. But Zemlak kept his team in it, as he posted a shut out in the 30 minutes he played. Dmitri Orlov has been having a great development camp. In his scouting report they call him an "opportunistic hitter" and he did find a couple of opportunities to pull out his hip check. He has the speed to make up for mistakes, he knows when to pinch in and when to back off. Very rarely was he ever out of position. Toward the end though, the Group B just couldn't over come the skill and speed of Group A and Orlov was not completely immune from being taken advantage of. Perreault pick-pocketed Orlov for his second goal of the day and that was the dagger in the heart of any comeback for the blue team. Speaking of blue team players that impressed, Cody Eakin also did well. His speed factored in two goals for the blue team. One an assist, the other a goal. John Carlson also helped the blue team's cause with a couple of good clears and some great passes. He has yet to have a chance to open up and use that cannon of his. There was a scary moment in the scrimmage when Jake Hauswirth crashed the net with Anton Gustafsson. The pair of them went into the net hard and Lil' Gus got the worst of the goal post. He cut his forehead really bad and he was stunned and on the ice bleeding as trainers came to the rescue. Hauswirth and Zach Miskovic (who also was in the collision) looked to be a bit shaken but okay. Braden Holtby, the white team's goaltender, was hardly hit at all as the players dove to miss him. Gustafsson did not return. Injuries weren't uncommon on the fourth day of Development Camp. Patrick Wey caught a puck in the mouth, required stitches. Stefan Della Rovere had to sit out due to a sprained shoulder (he also had stitches on his upper lip). Joe Finley took a stick up high and got cut on his lower lip. It is a sign that every player is playing as hard as they can to impress the Caps' management. Finley has been slowly improving through the course of the camp. On day one, he seemed to want to hit everything in sight, often slipping out of position to do it. In scrimmage two, he played a better positional game, letting the hits come to him. He also tightened up his discipline after getting whistled for two penalties in scrimmage one. I would not be surprised if the coaches decide to mix up some of the players between Groups A and B. Group A just was too much for in the second scrimmage. The only answer the blue team seemed to have was being more physical and pray their goaltender can help them out. Saturday's scrimmage should be a good one in either case. Jeff Schultz did sign his qualifying offer, but faxed the one year, signed contract not to the Caps office. Instead he faxed it to NHL headquarters. It doesn't void the contract, usually the Caps will alert the league's office of the contract signing. But the confusion made for some he said, they said comments last night. In either case, Schultz will be back as a Capital for next season. Japers Rink figure a way to see everyone tweets from development camp. It was very sweet of him to include mine, as choppy and mis-spelled as it was. The Caps' prospects got a guided tour of the DC and WashingtonCaps.com was there to film it. At one point Jake Hauswirth is wired for sound, it is both funny and educational! Also if you watch within the opening song sequence you will see Garrett Mitchell almost miss the bus after the White House stop. Group A, dressed in the white Capitals' practice jerseys, defeated Group B, dressed in the blue, 5 - 2. Michael Dubuc scored the hattrick for the white team, while Braden Holtby was the only goaltender to post a shutout in 30 minutes of play. The day included some big hits and some great action. For a first scrimmage, the boys didn't disappoint. One thing was for sure, just about every player gave it their all. Not one player came off the ice dry, everyone broke a sweat. Stefan Della Rovere had the best performance of the day before he hurt his shoulder. He was physical on the puck and created opportunities deep in the white teams zone. All was missing was a goal for the tough forward, but there were no shortage of hitting. At one point Della Rovere hit Joe Finley behind the net. Finley took the worst of the hit, he fell like a heap against the boards to the ice surprised to be hit that hard by a little guy. Unfortunately, DR missed a check early in the second half and went into the boards hard. He will have his shoulder examined, he won't know until tomorrow whether he can continue. Dmitri Orlov also played well, the best defenseman on the ice by far, in my opinion. He had two massive hits, one on an invitee Sorkin. He cut into him with a good hip check and it sent Sorkin flying head over heels. The other hit was a good shoulder check on Zack Miskovic. Orlov was solid on defense, a good skater he was never really beat. Also on the blue team side John Carlson played well, getting a goal off of a rebound from a Orlov slapper on Dan Dunn. Josh Godfrey did well, but he would at times carry the puck into the offensive zone and tend to stay there a bit longer than he should. Often a forward was left behind to play defense and that led to white team chances. On the white team, Mathieu Perreault was a tremendous puck mover that worked hard. He actually broke his skate when he side stepped a hit from Della Rovere. He missed a few shifts as they fixed his skate. Michael Dubuc also had a good game. He scored the last three goals for the white team, a hattrick. It included an empty netter goal for his second goal, and then he scored after that one with mere seconds left on the clock. Braden Holtby was very good in net for the white team. He was the only goaltender to post a shutout, and he had to kill off a penalty in the first minute when Finley took a tripping call just :16 seconds in. He was solid, calm and collected in net. Those that seemed to disappoint to me were Anton Gustafsson and Joe Finley. Gustafsson just seemed lost in the shuffle. He did nothing really to stand out offensively. He had a few back checks that were impressive, a couple of good defensive plays. But he did not produce much on the offensive end. Lil' Gus might be feeling the pressure of the Capitals and his father's legacy. Finley did what he could, but he wasn't the fastest or the hardest hitting player on the ice. He took two penalties, one a trip and the other was a high stick to a player in front of the net away from the puck. Finley is a big guy, no doubt, but he was hit off his feet by some smaller players. Not a good game for him. Tomorrow will be the second scrimmage, at the same time 3:30 pm, with the third one on Saturday. The Caps get some key players back into the fold. Defenseman Shaone Morrisonn forwards Kyle Wilson, Eric Fehr and Chris Bourque signed their qualifing offers (all one year deals). Steve Pinizotto signed a two way, two year contract with the Capitals as well. There is some confusion over if Jeff Schultz signed his contract but I am sure that will be sorted by tomorrow. The Capitals schedule has been released. The open at Boston on October first. Then they return home to play Toronto for their home opener on the 3rd of October. Then the schedule just gets harder as their next four opponents will be Philly, NY Rangers, Detroit and New Jersey. Tough start. GM George McPhee said it is 50/50 whether or not the Capitals will play at Olympic Stadium against the Montreal Canadiens. The Habs reported having a game at the gigantic stadium on November 28th, and the Caps are scheduled to play Montreal on that date. But nothing has been finalized. "You always look at what benefits the team," Bruce Boudreau said when asked about playing at the stadium, "For the coaching staff you have to look at all the positives and all the negatives in doing it. Right now I don't know enough of either." The Capitals' prospects will do some time trials and agility stuff this morning. This afternoon will be the intrasquad scrimmage. It's the first of three such contests through out camp pinning Group A against Group B. Both Groups have had a chance to get a taste of the Caps' system in practices on Monday and Tuesday. Practice can tell the coaches a lot about a player; his work ethic, what he is capable of and more. But there is something about putting these players in a game-like atmosphere. It brings out the competitive side. Several players that sort of just got by in the practices, but impressed in the scrimmages. One of which was Jake Hauswirth in last summer's camp. He was an unknown when he came to camp. But when the scrimmages started, Hauswirth used his size and good hands to impress both management and fans alike. It eventually led to a contract for him. Stefan Della Rovere had a similar story. The youngest player on the ice last summer excelled in the scrimmages and now, this summer, he could find a job in Hershey. The scrimmage is at Kettler Capitals Iceplex, and the puck drops at 3:30pm. I will be doing live tweeting from the scrimmage as soon as I get there this afternoon. Expect a big crowd. Do you see something interesting? No Southeast Division teams. Hmmm. The regular season schedule is do out today (7/15) around 3 pm. The first Capitals Convention tickets are on sale and nearly 1,000 tickets were sold in the first hour (according to Caps' PR). More info on how to buy tickets and more about the convention can be found on the Capitals' website. This morning was my chance to check out the skaters in Group B in the morning sessions for the Capitals' Development Camp at the Kettler Capitals Iceplex. The second group consisted of Anton Gustafsson, John Carlson and Francois Bouchard to name a few. There were a few standouts this morning for me. John Carlson is a lot faster than he was last summer. Along with his improved speed is his overall look. He played well. Besides a few flubs here or there, Carlson's play was heads above shoulders better than his piers. He also looked to be a good leader as he had to fill in the details to his line mate Dmitri Orlov (who also did well today I thought) on what they were doing. Defenseman Josh Godfrey returns to camp coming from the championship winning ECHL South Carolina Stingrays. He did well this morning and is playing with some confidence. The line of Jake Hauswirth, Stefan Della Rovere and an invitee named Meyer were the best line I have seen in camp thus far. In a 3 on 3 drill, the three moved the puck effectively along the wall and keeping their feet moving. The result was a pretty top shelf goal and the only time I said "great play" all day. Della Rovere looks as if he gained some weight and his confidence is over brewing on the ice. He looks stronger and smarter than last summer. Dean Evason, assistant coach, was in charge of the practice. The coaches ran the players through a series of complicated drills to test the players ability to think quickly. Hershey's new coach, Mark French, was also on the ice often stopping drills for better instruction. The practice was a physical and mental workout for the players, with emphasis on speed and accuracy. One player that impressed me with his speed was Cody Eakin. The kid's got wheels with his size his biggest down fall. At one point he chased down a line mate in a drill the length of the ice with at least two strides behind him. Anton Gustafsson seemed a little lost in the crowd today. He was neither outstanding nor bad. It could be that it is day two, but I was expecting a bit more. Tomorrow afternoon there will be the intrasquad scrimmage, the first of three. Many players will be looking to make an impression on the Caps' management so expect each one to be a competitive and enjoyable event to watch. It was brought to my attention this morning that the Detroit Red Wings had the player rights to prospect Nils Backstrom. It's true that Backstrom was drafted by the Red Wings, but they never signed the player making him a free agent. The Capitals re-signed Boyd Gordon. He accepted the one year, $761,250 contract to stay with the Caps. The Dave Fay Memorial Hockey Game is set. It's an event with celebrities playing for a good cause. The game will be on July 25th at Kettler. The Capitals' Development Camp rolls along and this morning I will get the chance to take in Group B, the afternoon skate that I didn't see yesterday. From all reports, this group seems a bit more polished and professional with Anton Gustafsson and John Carlson both impressing management and fans alike. Also in Group B are a couple of goaltenders that are new to the Caps system. Both invitees, Dustin Carlson and Garrett Zemlak (another Garrett, what the heck!). Zemlak played with the Prince Albert Raiders of the WHL and posted a 16-12-1 record and a .896 save percentage in 33 games played. Carlson played 39 games with Ohio State and posted a 21-12-3 record and a .917 save percentage. An interesting note to this year's camp, at least 10 of the camp invitees wore either the Captain's C or an Assistant Captain's A on their sweaters last season. That is a lot of leadership in the locker room at this summer's camp. If you see Andrew Glass today at camp, wish him a happy birthday. He turns 20 today. He skates in Group A. You can follow my observations of the morning skate at Kettler on my Twitter account: twitter.com/pckhdsthghts. Boyd Gordon accepts his qualifying offer of $761,250. Seems small change for a very important part of the Capitals penalty kill and face off man. Having Gordon in the hand definitely makes the defensive side easier for the Capitals. For more info, check WashingtonCaps.com. Group A took the ice this morning at Kettler and I had a chance to check out the kids. It turned out to be a grueling two hour practice where the coaching staff threw just about everything they had at the prospects attending the summer development camp. Some struggled, some excelled and others impressed. Of those that stood out, for me, were Mathieu Perrault, big guy Joe Finley, Joel Broda and Trevor Bruess. 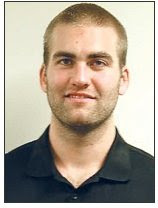 As well as goaltender Braden Holtby. For Perrault, this is old hat (his third camp to date if I am not mistaken). Not much phased him through the whole practice. He stayed consistent and played tough. Finley seemed to welcome the challenge in defending Perrault during a one on one drill. Finley is all about size, at 6'7" and 240 you can hardly miss him on the defensive line. But Finley doesn't have Perrault's speed so Finley had to cheat a little around cones and make more direct cuts to keep up with the speedy forward. At one point Finley caught up with Perrault only to deflect his shot right up into his face below the visor (jaw or chin). Finley shook it off and didn't even miss the next round. When they got to the 5 on 3 and 5 on 5 drills, Finley wanted to show case his physicality. He missed two hits at center ice and the one good hit he got in took him out of position, leaving his linemates high and dry. I'll chalk it up as rusty-ness for now. Joel Broda also impressed. He has a nose for the net and doesn't shy away from being physical in front of it. His linemate, Trevor Bruess, was the agitator of the day in the 5 on 5 drills. He was also involved in most of the hitting (both giving and receiving). Bruess loves to cut off wingers, get in the grill of the defenders and create havoc in the neutral zone. And all of it for practice. I can't wait to see what he does for the scrimmages. Those having a tough time were players that were none too familiar with Bruce Boudreau's deep need for perfection and their first time to a NHL development camp. You can say it was nerves and complex drills thrown at them on the first day. "That was real competitive. Coach Boudreau is a really good coach. You better have your thinking cap on and make sure you listen." Trevor Bruess tweeted after the practice had ended. Zach Miskovic had a tough run of practice. Often falling behind or asking others what was going on. Garrett Mitchell also seemed lost in the crowd. I was watching for him to step in, be more aggressive and physical, he choose the "wait and see" strategy a few times. As did many of the first timers who were trying to get it all down. Nils Backstrom, an invitee, looked out of shape at the end of practice as he was getting out skated by the Holtby the goaltender during the last skating drill. Speaking of Holtby, this has been a different goaltender from the year before. Last summer, the then 19 year old looked a bit out wide eyed and tentative. You could see the potential he had. This summer, it's plain to see how much he has grown. Not only has he filled out his pads, but he is making smarter decisions with the puck. He is calm and collected and he came up with some very solid saves through out the two hour session. He did have some trouble going side to side and challenging a bit, but it's easy to see that Holtby could be in chocolate brown next season. Dan Dunn was the other goaltender and he looked much as he did last summer. Good size, solid fundamentals. Besides that, nothing to fancy. He is has a solid butterfly that is hard to beat (because of his size 6'5", 200 lbs.). Dunn and Holtby still have some growing to do, mainly in the rebound department, Holtby more than Dunn. But camp is still young. "I was rusty out there," Holtby tweeted after the workout. "It's a feeling-out process for most of us on the first day. And the first bag skate always hurts." I was only able to take in the morning skate, I will be back out to Kettler tomorrow morning to take a look at Group B. You can always follow me and my observations on my Twitter account: twitter.com/pckhdsthghts. George McPhee announced today the hiring of Mark French as head coach of the Capitals' farm team, the Hershey Bears. French was in town for the development camp. The Capitals have put up a few of the coach's comments up on their video page. Not like it ever left, but the Capitals bring their prospects to town. A roster of 24 were released before hand of draft picks and college free agent signings. But there will be more players that will be invited as is the normal. Kettler will be alive again with Capitals' hockey, even if those players take a few years to don the Caps' sweater. The prospects will be split into two groups; Group A and Group B. Some of those in Group A will consist of Joe Finley, Braden Holtby, Zach Miskovic and Mathieu Perreault. Some in Group B will be John Carlson, Francois Bouchard, Stefan Della Rovere and Anton Gustafsson. Although players may be switched from groups A and B at any time. The first group will take the ice at 10 am, while the second group will be able to be seen at 2:30 with both sessions lasting at least an hour or so. The prospects will also be doing off ice activities that include agility tests, classroom work and video critiques. Three intrasquad scrimmages are scheduled on Wednesday and Thursday at 3:30 p.m. Then the big scrimmage on Saturday at 10:30 a.m. wraps up camp. We are within 24 hours of the Capitals start of development camp at Kettler Iceplex and there are just seven players left to take a quick look at this weekend. While we are still months away from training camp for the Caps' players, the development camp gives the Caps management and fans a chance to take in some of the future Capital stars. And one of those prospect players could be the most anticipated to be seen by both. Anton Gustafsson has a familiar surname in these parts. The son of Cap legend Bengt Gustafsson, Anton did not make it to last year's camp due to a back injury. This year will be a chance for the Capitals to see what this first round pick can do. Once rated second on the list of Capital's top prospects (compiled by Hockeysfuture.com) he comes into camp with the most to prove. Anton only played 25 games last season for Bofors IK in Sweden (in his hometown) but scored six goals and four assists in that time. A good two-way centerman, Gustafsson will have to work for a spot in the Capitals' organization. He was chosen 21st overall (1st round) in the '08 Entry Draft. Dmitry Kugryshev was another Capitals' prospect that attended last summer's camp and raised a few eyebrows. He is a talented forward that played in the QMJHL for the Quebec Ramparts. He had an immediate impact becoming the top scoring rookie in the league with 74 points (34 goals and 40 assists). He was also on the Russian junior national team that placed third in last years World Junior Championship. What you may not know about Kugryshev is that he has his own blog: http://www.icedaily.com/action/blogsByPlayer?id=34. Although he updates it rather sporadically. He was selected 58th overall (2nd round) in the '08 draft. He was taking a water break in his truck from his self-owned Nobel and Greenlawn Landscaping company when the Caps called him two years ago to let him know he was drafted. Glass will be returning as a sophomore to Boston University in the fall. He was a member of the BU Terrier team that won the national title at the Frozen Four and the Verizon Center. This will be his third development camp for the Capitals. Glass was drafted by Washington 199th overall (7th round) in the '07 Entry Draft. Another returning prospect to this year's camp is Joel Broda who split his time between Moose Jaw and Calagary in the WHL this past season. Broda has a nose for scoring and he led the league with 53 goals in 67 games with his two teams. He also comes from an impressive hockey family line as his distant relative was a goaltending legend with the Toronto Maple Leafs, Walter "Turk" Broda. "Turk" was awarded two Vezina Trophies and helped the Leafs to 5 Stanley Cups in the '40s and '50s. Joel Broda was taken 144th overall (5th round) in the '08 Entry Draft. Eric Mestery will also grace our presence at Kettler. A tall, lanky stay-at-home defenseman, Mestery is ranked 16th on the list of top prospects for the Capitals according to Hockeysfuture.com. He was traded early last season from Tri-City to play with the Lethbridge Hurricanes. With the slew of puck moving defensemen, Mestery's talents as a dependable blue liner will make him an important part of the Caps future. Mestery was the Capitals' 57th overall pick (second round) in the '08 draft. The final two players on the Caps roster of development camp attendees are two players that will soon be teammates. Greg Burke is slated to play college hockey at the University of New Hampshire in the fall. Last year he played in the USHL for the Cedar Rapids Roughriders. He didn't get much ice time (only started in 8 games) due to injury. Before his misfortune, Burke was apart of the World Junior A Challenge as a representative for Team USA. It was USA's first championship win. Burke was picked 174th overall (6th round) in the '08 Entry Draft. Joining Burke at UNH is Phil DeSimone who was one of only 27 players to be named USHL's Player of the Year in '06-'07. That year when he played for Sioux City he tallied 73 points in 60 games. This fall he will be a junior when he rejoins his college team. DeSimone was selected 84th overall (3rd round) in '07. That is the entire list that was released by the Caps as players that will be attending this year's Capitals Development Camp. You may see a few more players than just the 24 on the list on the ice. Those will be invitees (Jake Hauswirth was one such invitee last summer). Some of those players could be future free agent signings or just players to make a robust roster for practices and scrimmages. We will know more about them tomorrow. Players will be split into two groups (Group A and Group B) and will hit the ice at different times. Players may switch back and forth between Groups. Group A will take the ice in the morning at 10 a.m. The first scrimmage is not slated until Wednesday at 3:30 p.m. There will be another scrimmage on Thursday and the final scrimmage on Saturday. A full schedule and list of players can be found on the Capitals' website. It's like Christmas in July, hockey back in DC! See you at Kettler. This weekend we are taking a closer look at who will be attended the Capitals' development camp. This year's Development Camp starts on Monday, July 13. Included on the list of 24 players released are three players that were never drafted. One made a huge splash last summer and he is first on our list today of players to watch at Kettler Iceplex next week. Jake Hauswirth impressed the Caps management and fans alike in his brief stint in last year's camp. He was slated to go to his father's college, Michigan Tech to play. But instead he stayed on with Omaha Lancers in the USHL and tallied 28 goals (52 pts) in 58 games played. It was not long before the Caps followed up their interest with a contract. While he was a virtual unknown last year, he will return to Washington better known with fans and media and with a chance to play for the Caps farm club in Hershey. Zach Miskovic played in every game through his four years in college. Last year he led all defensemen in goals with 16. 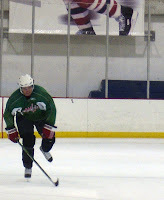 Miskovic was not drafted by the Capitals, but was signed as a free agent to the club. He was a first team All-American player for his efforts at St. Lawrence. Trevor Bruess (pronounced BRISS) is another college star that did not go through the draft and was signed by the Capitals as a free agent. He played the last three seasons at Minnesota State and led the team in penalty minutes. It is not out of the normal for the Caps to sign college free agents as five of those players have made an impact for the club. In fact, five former college free agents have played in a Capitals sweater last season: Jay Beagle, Sean Collins, Graham Mink, Brian Pothier and David Steckel. Joining the non-drafted at development camp are this year's drafted prospects. While the first rounder, Marcus Johansson, decided to stay in Sweden to train with his Swedish elite team for a preseason exhibition game against the Detroit Red Wings. The rest will be seen at Kettler next week. The rest of these players are all of the Capitals picks after the first round in the '09 NHL Entry Draft. They are listed in the order or round they were selected. Dmitri Orlov was slated to be taken in the first round in a lot of mock drafts. Instead, he was taken late in the second round by the Capitals. He is a defenseman that played in the KHL last season. He was named as one of the top three Russian performers for the under-18 World Championships. Orlov is a fast puck moving defenseman who has great offensive skill. Patrick Wey was taken in the fourth round and hails from Pittsburgh PA. We will be sure, if he is a fan, that he burns any Penguins paraphernalia he might have. Wey is the second defenseman the Caps have taken from the USHL (John Carlson also played in the USHL). Wey played for Waterloo and was the seventh leading scorer among defensemen in the league with seven goals and 27 assists. In the fifth round the Caps picked Brett Flemming. Another defenseman that is known for being a hard worker. He played for Mississauga St. Michael’s Majors in the OHL and had three goals and 25 assists in 64 games played. Flemming and Stephan Della Rovere are coming into camp with a bit of history as Flemming's team ousted Della Rovere's team in the OHL playoffs. Garrett Mitchell (besides having a great first name) was the seventh round pick in this year's draft for the Capitals. He comes to camp as a 17 year old and a chip on his shoulder. Mitchell registered 140 PIMs with the Regina Pats in the WHL (his hometown as well). He had 14 fighting majors included a scrap with fellow camp attendee Joel Broda. Last but not least, the Capitals took Benjamin Casavant in the seventh and final round of the draft. He averaged over a point a game with Prince Edward Island in the QMJHL. A high scoring left wing, he tallied 39 goals and 41 assists in 68 games played last year. But don't think he is a player that scores on the pretty play, a large amount of his goals happen in front of the net on rebounds and crashing the net. Tomorrow we clean up the list with the rest of the field that includes a prospect that has some fine Capital lineage and another prospect that has his own blog. The Caps get a centerman by signing veteran Brendan Morrison to a one year contract. Details to come soon, right now I am walking into a happy hour. Over the next three days, PHT will be taking a closer look at the kids coming into town over the weekend for the Capitals' development camp. Some players we will be seeing for the very first time while others may look at next week's development camp as old hat. Either way, the Capitals have invested heavily in their draft picks and their scouting. Camps like these give the Capitals' organization and the fans a chance to see the fruits of that labor. First let's take a look at some of the returning crowd to Kettler. John Carlson is rated number 3 on the list of top prospects in the Capitals' system according to Hockeysfuture.com. This will be his second stint in development camp. The first time around the coaching staff have the defenseman some critiques and when training camp started a month or so later, he didn't let those constructive comments go to waste. He spent last season with the OHL's London Knights (former Cap Dale Hunter's team) then was sent to Hershey when the Knights were eliminated from the playoffs. Not only a top prospect for the Capitals, he will also attend the U.S. national junior evaluation camp in August. He was a first round pick, drafted 27th overall in the '08 NHL Entry Draft by the Caps. Mathieu Perreault played his first full season with the Hershey Bears last year. He also was featured in 21 playoff games in the Bears' march to a Calder Cup Championship. He tallied two goals and six assists in that playoff run. If you can remember, Perreault was the scoring champ in the QMJHL with a 114 points, he led all Hershey rookies in points and was 10th overall in the AHL. He was chosen 177th overall (6th round) in the '06 Entry Draft. The move looked familiar, as it is the same one his brother (Minnesota Wild's Pierre-Marc Bouchard) has used successfully against Chicago and San Jose in NHL shootouts. You may think that Francois picked up the move from his older brother, but it is the other way around. After Pierre-Marc debuted the move in 2006 he was quick to credit Francois for coming up with the idea and showing it to him first. Bouchard registered with 15 goals and 20 assist in 64 games with the Bears last season. He was the Capitals 35th overall (2nd round) pick in the '06 Entry Draft. If there was ever an up and coming pest in the NHL, it could be Stefan Della Rovere. The 5'11", 196 lbs. forward is a pure agitator that other teams love to hate. He makes his second appearance at the Capitals' development camp. He spent last season with the OHL's Barrie Colts and was apart of the World Junior Championship gold medal winning team Canada. He racked up 149 PIMs in Barrie, but also nearly had a point a game with 51 points in 57 games. Della Rovere was picked 204th overall (7th round) in the '08 Entry Draft. Braden Holtby (pictured left), a prospect goaltender, surprised many in last year's camp. But his good play at camp didn't end with training camp last summer. Holtby started in 61 games for the Saskatoon Blades and was one of two goaltenders to hit the 40 win mark by season's end. Holtby practiced with the Bears during their playoff run and may play a bigger role in Hershey's goaltending depth next season. He was picked 93rd overall (4th round) in the '08 Entry Draft. If Josh Godfrey's name sounds familiar, it's mostly because of his defensive partner Karl Alzner as both were on the '08 gold medal team for Canada (they were also partners on the Calgary Hitmen squad). The pair worked together for their country, but Godfrey was hampered with an injury last year. He spent a majority of it not with Hershey, but with the South Carolina Stingrays (who were also champions last year, defeating the Alaska Aces for the ECHL's Kelly Cup). Godfrey shows how talented and deep the defensive core is for the Capitals. He was the Capitals' 34th pick overall (2nd round) in the '07 Entry Draft. The Capitals' biggest prospect (literally) would be Joe Finley. The 6'7", 240 lbs. defenseman has been to a Caps development camp before, but he has missed the previous two due to his college obligations (college players can attend a NHL camp, but NCAA rules stipulate they must pay their own way to the city and for their own accommodations). He suffered through an injury last season, but Finley has been a rock on the blue line for the North Dakota Fighting Sioux. Most will remember Finley as a tough guy who once punched a guy in the line to shake hands and he also went after a visiting team's mascot. He was an '05 draft pick. Also returning is Dan Dunn (pictured right), a big goaltender who spent last year with St. Cloud State. But he may be looking for work this year as he played second chair to junior Jase Weslosky, who was drafted by the Islanders. Dunn only started 5 times last season and played in nine games. It will be an important camp for him. He was selected 154th overall (6th round) in the '07 Draft. Tomorrow we will look at a few more prospects that will grace our presence at the Capitals development camp, included a pair that were not even drafted. Today marks a sad day in NHL history. Joe Sakic, Mr. Clutch himself, is hanging up the skates and is moving on. He has been a franchise player first through the Quebec Nordics and then when they moved to Denver to be the Colorado Avalanche. Many people don't realize, unless you watched those amazing playoff series between Detroit and Colorado or Dallas and Colorado in the nineties, when the Aves needed a goal Sakic scored that goal. Whether it was overtime or minutes left in a game, you can bet the winning goal came off of Joe Sakic's stick. He had 105 career game winning goals (including playoffs) and a NHL record of 8 playoff overtime goals. Sakic had one of the best wrist shots ever. "For twenty years, I tried to shoot the puck like Joe and was never able to do it," Steve Yzerman said in a interview on the NHL Network. It was fast and hard and goaltenders had little chance of stopping the puck when Sakic was on his game. Sakic's resume includes 2 Stanley Cups. He is 8th on the NHL All-Time list for points (1641), 11th on the NHL All-Time list for assists (1016), 14th in NHL All-Time goals (625), 7th on the list for NHL All-Time playoff goals (84), 3rd All-Time NHL playoff goals in a single season (18) and 13 NHL All Star game selections. Sakic had six 100+ point seasons, nine 90+ point seasons. He was captain of the Aves for 17 years (16 consecutive). It is an impressive Hall of Fame resume. We are going to miss you Joe. I am just glad I stayed up all those late nights to see your overtime winning goals, even if I was tired for school the next day. It was worth it. I also had a chance to see you in Salt Lake in the Olympic gold medal game, it was a game for the ages and Sakic was clearly the best player on the ice in that tournament. Good luck Joe to all of your future endeavors. The Capitals start their development camp on Monday (July 13th), with a slew of players making the trip to Washington over the weekend. Today the Caps have released the roster of players that will be attending. There are a few familiar faces and a couple '09 draft picks that will make their first appearance in Arlington. Among those we will be seeing for the first time up close is Anton Gustaffson. The 6'2", 194 lbs. centerman is the offspring of one Bengt Gustaffson, a former Capital great. Whether that adds to the pressure of of Anton making the team and doing will remains to be seen. He missed last year's camp with a back injury. Also of those we will be seeing for the first time will be '09 draft picks Brett Flemming, Cody Eakin, Benjamin Casavant, Garrett Mitchell, Patrick Wey, and Dmitri Orlov. Orlov was a surprise pick for the Capitals, as he was slated to be taken in the first round, but was passed over. The Caps snatched him up in the second round. The only '09 draft pick whose name is off the list is first round pick Marcus Johansson. This was probably expected since Johansson is still under contract for another year with his Swedish elite team. Of the returning players, we will get another look at Jake Hauswirth, John Carlson, Francois Bouchard, Stefan Della Rovere, Dmitry Kugreyshev, and goaltender prospect Braden Holtby. A complete list is available on the Capitals' website as well as the schedule of on-ice activities for the youngsters. Also yesterday, the Capitals took a page from the Chicago Blackhawks notebook and have scheduled a Capitals Convention at the National Harbor. This gives fans an opportunity to meet players, ask questions of the coaches and management and so much more. This is an amazing opportunity for fans to get a up close and personal view of their favorite team. The convention will be held on Saturday Sept. 26. Okay a lot of NHL drama going on, I can't keep my opinions to myself much longer. Some if it is older news, I know. But I've been busy. First, Danny Heatly asking for a trade and refusing to be traded to Edmonton. The drama seems to be in limbo at the moment. I think the very action of asking for a trade waives any kind of trade clause on any contract. Also, if you ask your general manager for a trade after you publicly committed to money and time to be with a particular team you give up any say over what team you may be traded too. At first I thought Heatly was an okay guy, not any more. Second, Chicago and their paperwork. I guess when you live in the windy city, one should get a paper weight (sorry old joke). Now the NHLPA has filed a grievance with the league over the paperwork. At worst, some big players for the Blackhawks get a taste of the free market as unrestricted free agents. But they were already restricted free agents and Chicago had a right to match the contract offered them. It may not be a huge deal. Plus the other 29 general managers may just give the "too bad" signal to the players association and not sign any of the players with bad paperwork, allowing Chicago to resign them. At least the PA is looking out for their own. Third, Alex Ovechkin becomes an ambassador for the 2014 Winter Games in Sochi. There is a possibility the NHL will pull out of letting players play in the Olympics, but that is maybe why they made Ovi a full fledged ambassador. It's also a great pick up line for the ladies I'm sure. You have to admire Ovi's countryman's spirit. Lastly, Brian Burke successfully gets his goaltender. TSN reports Burke has gotten Jonas (the Monster) Gustavsson to be the starting goaltender for the Toronto Maple Leafs. Possibly leaving long time Capital Olaf Kolzig with out a team if the Leafs do not resign him. He is a Free Agent this summer. Gustavsson comes highly touted from the Swedish Elite League. He has size (he looks big in net, hence the nickname 'Monster') speed and good basics. However, he hasn't seen scorers like Evgeni Malkin, Jerome Iginla, Ilya Kovalchuk or Ovechkin. So he is basically a wild card for the Toronto Maple Leafs. Some of his highlights are on YouTube. Barrack Obama mentioned Alex Ovechkin's name in a speech and some fans were quick to jump on the "why doesn't he come to Caps' games?" critic. Honestly, I think he has much more important things to do rather than take in hockey games or basketball games. Like finding jobs for hundreds and thousands that will be on the street after the States budgets get slashed. Just my gut reaction. Okay, back to hockey. Development camp is less than a week away and as usual the Caps are going to lean heavily on the kids for the future of the team. The names to watch will be Anton Gustafsson (who missed last year's camp due to injury), Joe Finley (the big meany from North Dakota), Jake Hauswirth (who made quite the splash in last year's camp) and first round pick in the '09 Entry Draft Marcus Johansson is not confirmed to be there, but is likely to show. Camp is from July 13 - 18. All this week, be sure to turn on NHL Network as they will be replaying the Rangers/Capitals series starting with game one today. Relive the Caps first series win in nearly 11 years. Milan Jurcina is the only Capital that filed for arbitration, as is his right to being a restricted free agent. The other Capitals that were given qualifying offers did not file for arbitration. Shaone Morrisonn filed for arbitration last year and was awarded a one year, $1.975 million contract and remained a RFA. His qualifying offer was a flat $1 million and due to his hearing result of $975,000 more it had put the Caps over the Salary Cap at that time. He had an opportunity to file for arbitration this year but did not. Along with Mo, forwards Eric Fehr and Boyd Gordon did not file. Jurcina made $912,500 last season. The one thing about taking time off, you never seem to have enough time for what you really want to do. I hope everyone has a great Fourth of July. I will be back just in time for development camp which starts up on the 13th. Let's hope the kids bring some fireworks of their own to Arlington. Just as predicted and just as wise, the Washington Capitals did not dive head first in the shallow pool of free agents on the first day. Instead, like a frugal shopper, they waded in and found specifically what they needed and left in time before the other kids started to splash around. That man they were after? Mike Knuble has been a steady consistent right winger for the Philadelphia Flyers. He has scored at least 21 goals in each of his last six seasons, scored 27 times and scored 47 points in the 82 games played last season for the Flyers. He is a grinder, hard working, nothing too fancy just get to the net type of player. A player's qualities that has been missing from the Capitals' lineup. The Caps signed the 36 year old (soon to be 37 as his birthday is on July 4th) to a two year, $5.8 million contract today. The only signing by the Caps on day one of free agency. From all accounts, this was the player to get. "Our scouting staff was unanimous, he was the guy we wanted," George McPhee told reporters via phone conference. "Backstrom, Ovechkin are going to have the puck a lot and we needed someone to go to the net." It's something the Caps seemed to lack in past years. They had a slew of pretty goal-getters but no one to do the clean up work in front of the net. Brooks Laich was called on to do most of that stuff on the power play, but he never really worked out. Here now, the Capitals have a veteran at it. "I'm pretty confident that the way I play the game and the things that I do that I've proven, playing with Joe Thornton and Peter Forsberg, guys like that," Knuble boasted his resume on the conference call. "I know what to do for these guys, how to work, win battles in corners and do a lot of the dirty work to get these guys the puck. I take pride in that. No one needs to tell me how to play with these guys." More than a few experts were ready with praise for the Capitals on the smart signing of the day. The price tag seems to even work out beautifully. The Caps aren't married to Knuble over 6 to 10 years and they get him for the same price he played for in Philly. Plus they get an excited veteran that already has his name on the Stanley Cup. He brings leadership to a locker room that sometimes did not have it. "It was everything I wanted in another team," Knuble told reporters about his new team. "It was on the East Coast ... another team that's considered one of the best teams in the Eastern Conference. I think this team is on the verge of something good, maybe even something great." While most Caps fans looked upon Mike Knuble's name in disgust before this signing because of his second overtime goal in game in game four of the year before playoffs, his presence in a Caps uniform should give them cautious cause to be optimistic. His leadership and veteran abilities should make him a valuable commodity for the Capitals in big games. He isn't there to be nice, he's there to make some noise, be sandpaper, add grit. A little growl in the Capitals' bark can't be all that bad. The Capitals had to let a fan favorite in Donald Brashear go. McPhee rationing was that Brashear was too much for what he was. Sure you needed big guys, but he did nothing for the Caps roster toward the end of the year or in the playoffs. "We are happy for Brash," McPhee said. "But we couldn't pay that number." Brash would replace Colton Orr on the New York Rangers' roster as their resident tough guy. Orr signed with Toronto. McPhee claims he isn't finished and it may take a couple of days to a couple of weeks for them to maybe add a piece here or there. He didn't flinch nor did he waiver in the face of a sometimes hectic crazy day. True to form, he got what he needed and bolted for the door. After George McPhee said he wasn't going to do much, the Washington Capitals have signed Mike Knuble to a two year/$5.6 million contract ($2.8 million per). This signing comes just moments after Donald Brashear signed with the New York Rangers for a two year contract. Knuble will bring a strong presence in front of the net. He brings a lot strength and size to the forward line as well as some soft hands and nose for loose pucks. Knuble had 27 goals and 47 points for the Flyers last year. He has scored at least 21 goals in each of the last six seasons and was a member of the Stanley Cup winning Red Wings in '98. Knuble will make roughly the same amount of money he made in Philadelphia, $2.8 million last season. According to the Caps PR, Alex Ovechkin is thrilled about the signing and called "asking for Knuble's phone number."